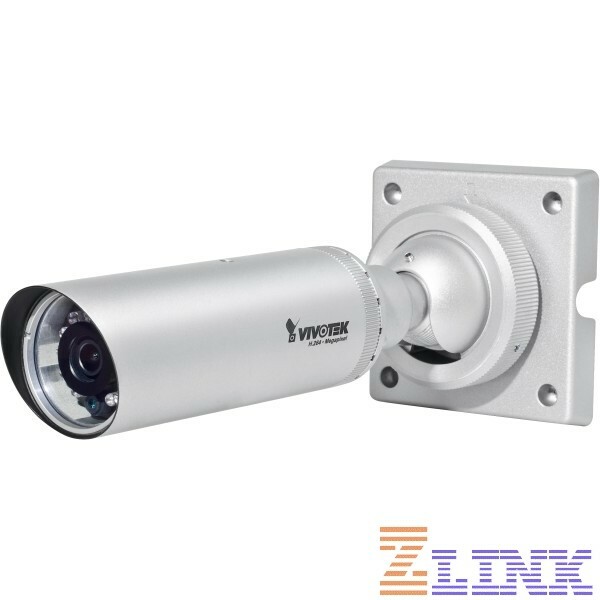 The Vivotek IP8332-C Bullet Camera is an IP66-rated weather-proof network camera which can smoothly record 1280x800 at 30 frames per second, has triple codec (H.264, MPEG-4, and MJPEG) for real-time compression, and is 802.3af Compliant PoE (can also be powered with 12V DC Power Adapter--not included). The IP8332-C has built in IR illuminators with an effective range of up to 50 feet (15 meters). With IP66-rated housing and including a robust bracket to protect the cables to the IP8332, this Vivotek IP Camera is ready to withstand the rain and dust. The tamper detection allows for event notification using HTTP, SMTP or FTP when a significant change in the image happens. The IP8332-C includes a removable IR-cut filter, 3 video motion detection regions, privacy masks, on-board storage (MicroSD/SDHC card slot), and live viewing for up to 10 clients from a PC or mobile device. The IP8332-C is ready to go as it includes a mounting bracket with cable management for protected installation and includes a product CD with Installation Wizard 2 and Vivotek's ST7501 recording software. In For more information, check out the available downloads from Vivotek (see the 'Technical Specs' tab above). Why Pay $285.00 for the Vivotek IP8332-C?